Spin-A-Bingo is a game combining bingo and slots features. The gameplay is similar to bingo, where you are given a set of cards, and you dab numbers on your cards from the balls that are called. 1. Instead of calling 1 ball at a time, 10 numbers are spinned simultaneously from a slot-like wheel. Once the numbers stop spinning, you can then match each of the 10 final numbers to dab corresponding numbers on your card, directly above each column. 2. You compete to get the HIGHEST SCORE. You will get additional scores for forming the pattern or getting a full card. While this does NOT guarantee a win, it will increase your chances of winning significantly. 3. The game does NOT end when you form a pattern or get a full card already. The game will end in 2 ways: (a) the total game time has elapsed, or (b) all the players have completed their spins already. Each time you dab a number or match a line, you will get a score. 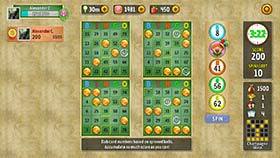 You are also given additional scores for forming a pattern, or getting a full card. The object of the game is to get the highest score than everyone else. Whatever current score you have will be submitted as your final game score if you are unable to take all your spins within the allotted game time. The TOP 3 HIGHEST SCORERS at the end of the game will win the GAME POT (or a portion of it). 1st place gets 100% of the game pot, 2nd place gets 75%, and 3rd place gets 50%. Multiple winners will also get the full percentage as indicated (ie the pot percentage is not divided if there are ties). The Top 3 scorers also have a chance to win the JACKPOT amount, if they are able to reach a final score of at least 3,500. A Yellow Star highlights the numbers you can dab on your cards. This is just a hint so you can easily spot which numbers can be dabbed. You must still manually dab each number. A Free Square icon lets you dab ANY number ANYWHERE, like converting the number to a free square. This means any number from any of your 4 cards can be dabbed. A Free Column icon lets you dab one number in the SAME COLUMN where the icon appeared, from any of the 2 cards directly above the icon. Go back to Spin-A-Bingo game page. Please note that chat is currently unmoderated, inappropriate behavior is not tolerated.